WASHINGTON - Barack Obama, having just squeezed out of one political box on Syria, is not about to jump into a new one by setting a time limit on crisis diplomacy. In his address to Americans on Tuesday, the US president advanced moral, logical and geopolitical rationales for unleashing military force to punish Damascus for a chemical weapons attack. But there were no hints as to how long Obama will let a Russian plan to secure Syria's chemical arms, play out before summoning his generals. Will it be days, weeks or months before Obama decides whether Moscow's manoeuvring is a face saver or has meandered to a diplomatic dead end? The White House won't say, reluctant to string another political trip wire for Obama, who talked himself into trouble by warning Syria that using chemical weapons would cross a red line. "He did not want to box himself in," said James Goldgeier, Dean of the School of International Service at American University. Ahead of crucial US-Russia talks on Syria in Geneva Thursday, Obama spokesman Jay Carney tangoed around timing queries. "I don't have a timeline to give you," Carney said. "What I can say is it obviously will take some time .... but we are also not interested in delaying tactics." Some foreign policy experts faulted Obama's speech because it was foggy on when Syria would have to hand over its chemical weapons. The absence of a countdown will lower the pressure on Damascus and take the heat off Russia, they say. "Is he going to give them 24 hours to demonstrate Syrian compliance? 96 hours? a week? a month? Longer?" asked Kenneth Pollack of the Brookings Institution. "All need to understand how the president intends to judge the success of failure of the Russian initiative, and how long he intends to give it to succeed or fail so we can know whether we are going to use force in Syria and when." The White House insists the last minute Russian diplomatic effort to head off US air strikes only emerged because Obama's threats of force were credible. But the more time elapses after the August 21 chemical outrage, the more the momentum behind idea that Washington really is ready to fire off its cruise missile will inevitably dim. Given mistrust between Russia and Western powers, the complexity of the Syria question and the difficulty of disposing of its chemical arsenal amid a brutal civil war, the chances of a swift resolution seem slim. So it could be weeks or months until a solution is reached - assuming the Russian initiative does not crumble before then. But for political and strategic purposes, the White House sees no advantage so far in talking timing. Deadlines once set, also have a habit of expiring - and Obama aides will be loath to commit their boss to any preordained course of action on a matter of war and peace. But without a timeline concentrating minds, diplomacy can dawdle. "The disadvantage is that there is only going to be action on the diplomatic front if the Syrians and the Russians believe that the US threat to use force is credible," said Goldgeier. "It is hard to make it credible if there is no time frame in which they are supposed to respond." There may also be a practical case for avoiding ultimatums - as time specific demands can chafe consensus in framing UN resolutions. In 2003, for instance, France blocked a US-British bid to give Saddam Hussein a deadline to disarm, and the fabled "second resolution" authorizing military force in Iraq never materialized. A spat over timelines is already clouding UN negotiations on Syria: a French draft resolution including a timetable for Assad to hand over his chemical arms was rejected by Russia on Tuesday. Clocks have also stopped on Capitol Hill - where lawmakers wonder whether Obama will come back to ask for backing to unleash the US military in Syria. Democratic Senator Bob Casey said time for diplomacy was finite. "It's very limited. It's not a few days, but it's certainly not multiple weeks," he told CNN. Democratic Senate leader Harry Reid has put aside a resolution authorizing force for now - but pledged to revive it if he senses foot dragging by Russia or Syria. "If there is any indication they are not serious or (there is) a ploy to delay - then Congress stands ready to return to that Syria resolution," Reid said. But Congress's leverage is compromised by doubts over whether the resolution would pass in the war weary Senate and the House. One factor not hostage to timing is military capability. 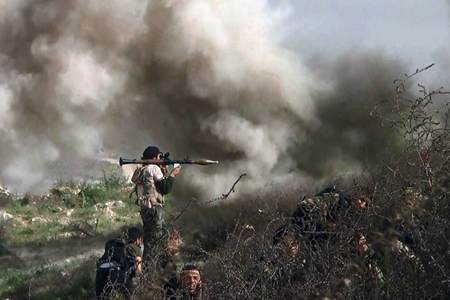 Defence officials said the US Navy could hit Damascus at a moment's notice. The limited nature of the planned strikes - likely from sea launched cruise missiles, means the Pentagon does not have to manage large numbers of troops or air wings. Four destroyers armed with Tomahawk cruise missiles remain in the Mediterranean and can launch strikes when ordered, officials said. And there are are no current plans to pull out the USS Nimitz aircraft carrier battle group from the Red Sea. 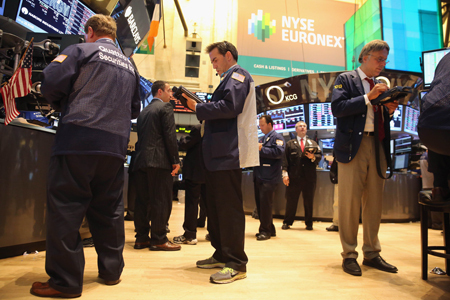 A stock trader makes last minute transactions ahead of the closing bell at the New York Stock Exchange on August 27, 2013. Stock traders make final transactions ahead of the closing bell at the New York Stock Exchange. 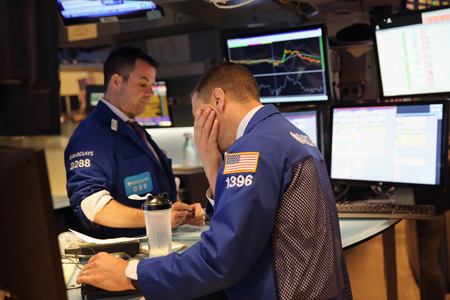 The Dow Jones Industrial Average fell 170 points on fears of a possible US attack on Syria. 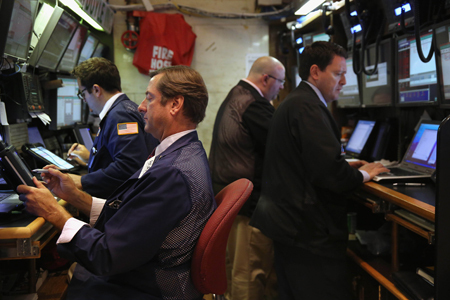 Stock traders make last minute transactions ahead of the closing bell at the New York Stock Exchange. 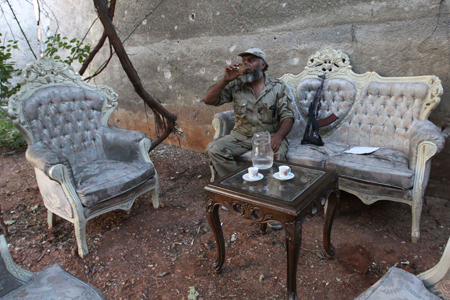 A Free Syrian Army fighter drinks water as he sits on a sofa in the old city of Aleppo. Mourners carry the coffin of a Shi'ite fighter from the pro-Assad Sayyid al-Shuhada Brigades during a funeral. 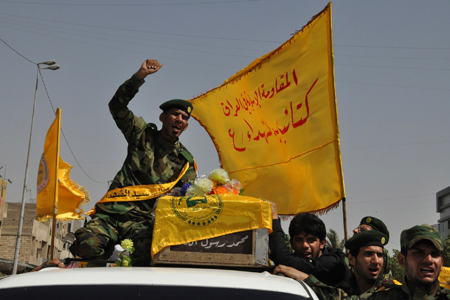 The text on the flag reads, "Islamic Resistance in Iraq, Sayyid al-Shuhada Brigades". 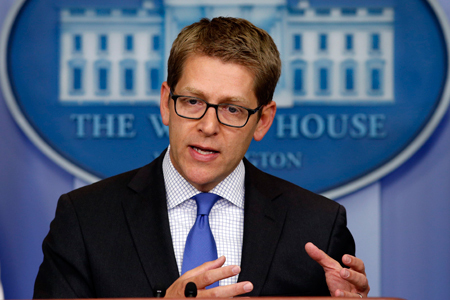 White House Press Secretary Jay Carney speaks about Syria during a press briefing at the White House in Washington August 27, 2013. Syrian Foreign Minister Walid Muallem said on August 27 the UN mission investigating alleged chemical weapons attacks in Damascus has been delayed until the following after rebels failed to guarantee the experts' safety. 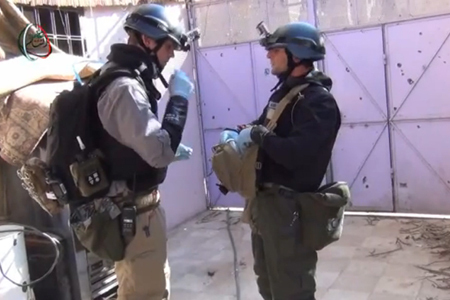 An image grab taken from a video uploaded on YouTube allegedly shows United Nations (UN) arms experts in Damascus' Moadamiyet al-Sham suburb as they investigate an alleged chemical weapons strike in the capital. 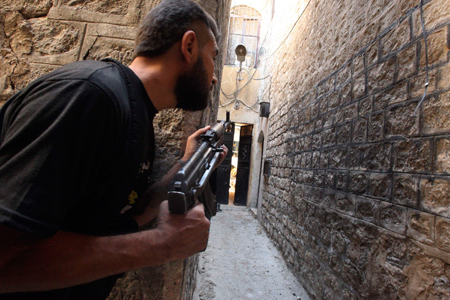 A Free Syrian Army fighter holds his weapons as he peeks at an alleyway. 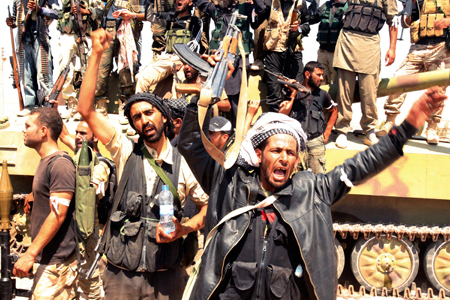 Free Syrian Army fighters hold up their weapons as they cheer after seizing Aleppo's town of Khanasir. 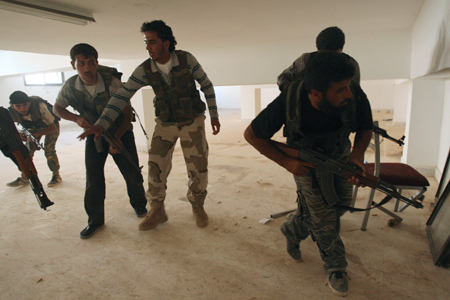 Free Syrian Army fighters carry weapons as they take up positions during an offensive against forces loyal to Syria's President Bashar al-Assad. 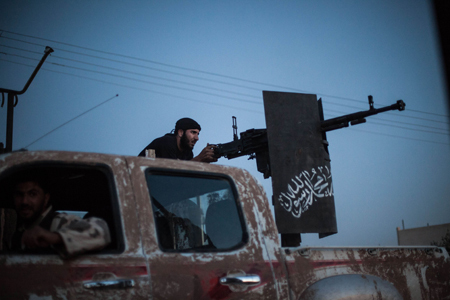 A member of the Islamist Syrian opposition group Ahrar al-Sham fires against a position of the Committees for the Protection of the Kurdish People (YPG), a militia set up to protect Kurdish areas in Syria from opposing forces. 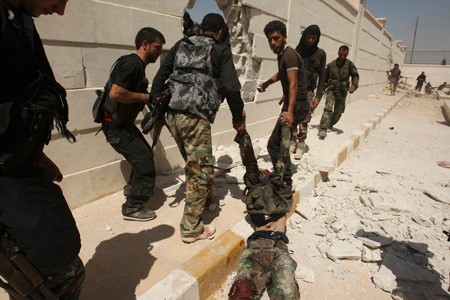 Free Syrian Army (FSA) fighters drag a body, which according to the FSA, is one of forces loyal to Syria's President Bashar al-Assad, during an offensive to seize Aleppo's town of Khanasi. An opposition fighter holding a rocket propelled grenade (RPG) as his fellow comrades take cover from an attack by regime forces. 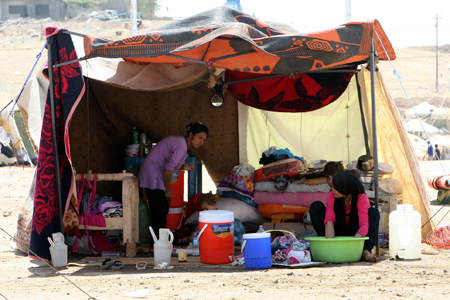 Syrian refugees, who fled the violence in Syria, are seen at a new refugee camp in the outskirts of the city of Arbil in Iraq's Kurdistan region. 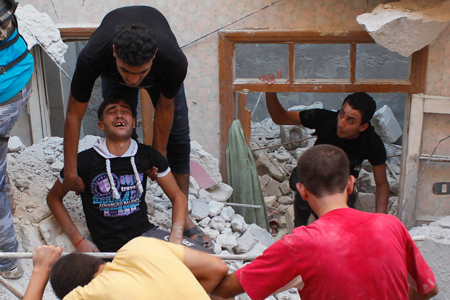 A civilian is comforted at a site hit by what activists said was shelling by forces loyal to Syria's President Bashar al-Assad. 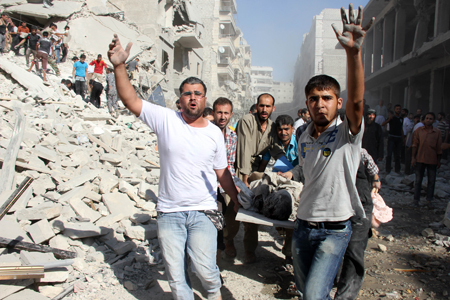 Syrians men evacuate a victim following an air strike by regime forces in the northern city of Aleppo. 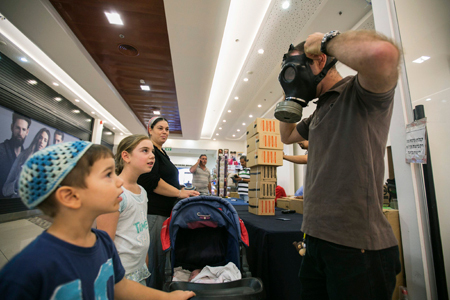 An Israeli man shows his children how to adjust a gas mask at a distribution point at a shopping mall. 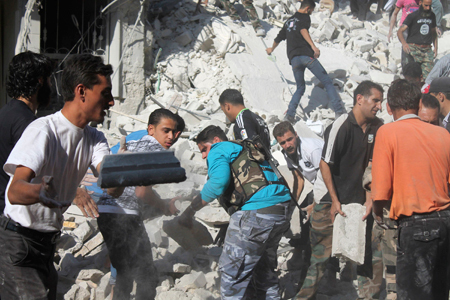 Men search for survivors amid rubbles of collapsed building after what activists said was shelling by forces loyal to Syria's President Bashar al-Assad. 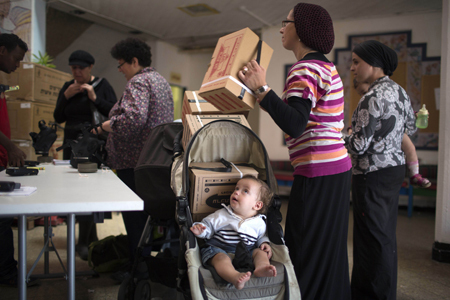 Israelis receive gas masks at a distribution centre in Jerusalem. 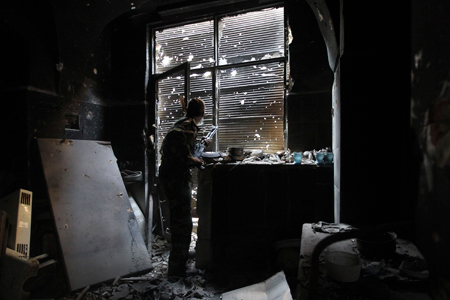 As talks of an international attack on Syria heighten, the demand for gas masks in Israel rose. 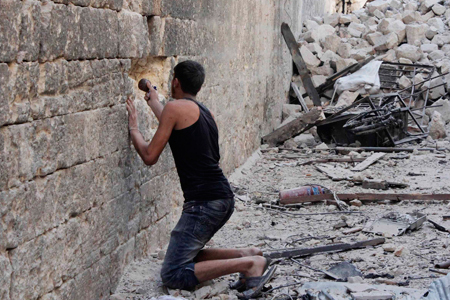 A Free Syrian Army fighter places a locally made bomb in a wall to make a hole for snipers. 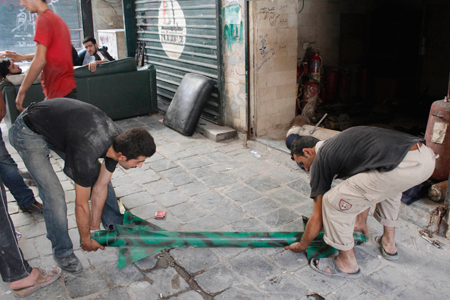 Free Syrian Army fighters handle a locally made rocket in old Aleppo, August 25, 2013. 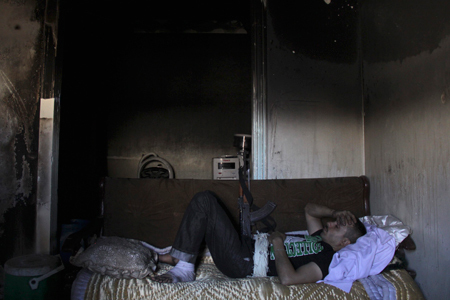 An injured member of the Free Syrian Army rests next to his weapon in a safe house. 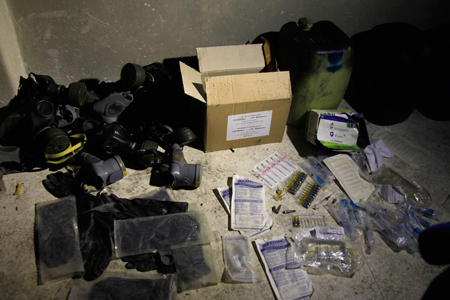 Chemical materials and gas masks in a warehouse at the front line of clashes between opposition fighters and government forces. 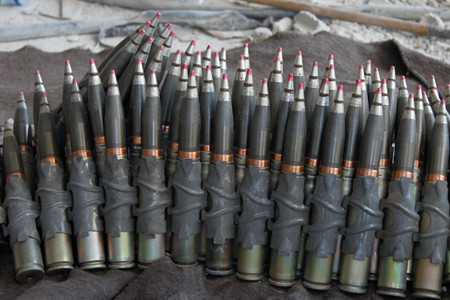 Ammunition is seen at an area controlled by forces loyal to Syria's President Bashar al-Assad at the front line during clashes with opposition fighters during a guided tour by the Syrian Army. 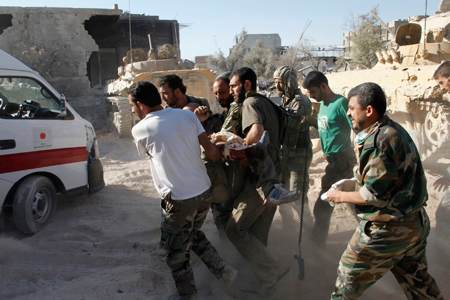 Soldiers loyal to Syria's President Bashar al-Assad carry a wounded soldier at the front line during clashes with opposition fighters in the Damascus suburb of Jobar, August 24, 2013. 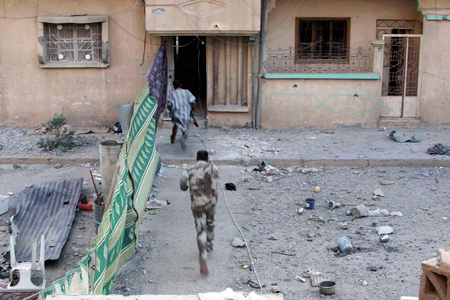 Free Syrian Army fighters run for cover from snipers loyal to Syria's President Bashar Al-Assad in Deir al-Zor. 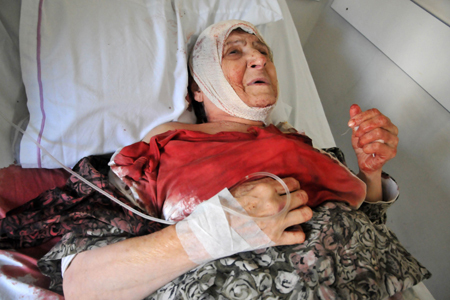 A Lebanese woman who was injured by a blast lays in a hospital bed. 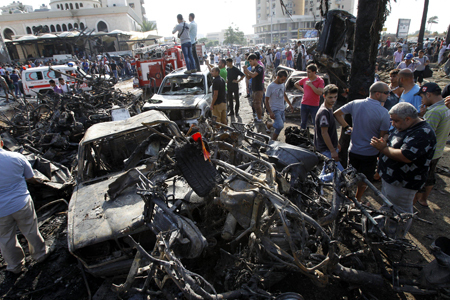 Lebanese civilians gather next to the site of a blast outside the Al-Taqwamosque in the northern city of Tripoli on August 23, 2013. Car bombs exploded outside two Sunni mosques in a Lebanese city riven by strife over the war in neighbouring Syria, killing 29 people and wounding 352, the health minister said. 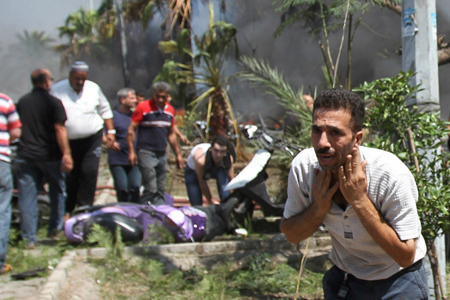 A man reacts outside one of two mosques hit by explosions in Lebanon's northern city of Tripoli.